What does it take to live a healthier and happier life? It turns out, surprisingly, that it’s positive relationships that are central to health and wellbeing - particularly during challenging times. Healthy relationships (of all sorts) benefit us not only through influencing our health choices but also by buffering against times of stress through social support. But in our stressful modern-day lives, maintaining face-to-face relationships can be a challenge. Today we’re focusing on romantic relationships, as while these are important we sometimes treat them as an afterthought. 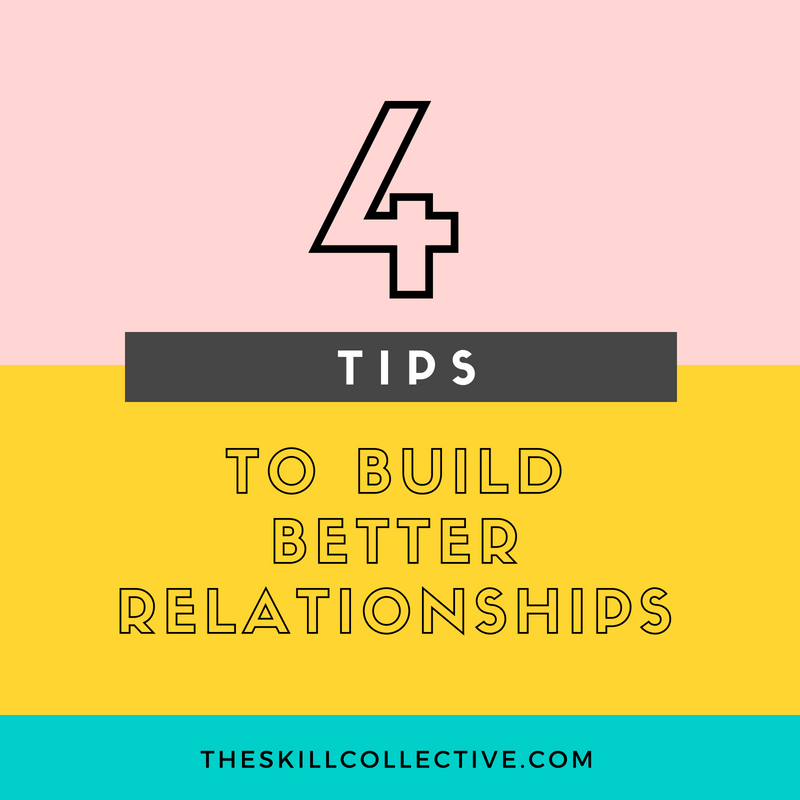 Read on for our 4 tips to build a better relationship with your partner. Does this scene sound familiar? Couples out for dinner or brunching on the weekend, sitting together yet not connecting. They may be Instagramming photos of their food, messaging friends, or simply just distracted, and there’s little conversation happening. Sure, they’re physically there, but are they actually present? Yes, life gets busy, and the temptation can be to 'get ahead' by checking devices, mentally rehearsing the mental To Do list, or multitasking. The problem is that when we're distracted we miss the opportunity to connect with our loved ones. And it shows – just as when you can tell if your partner has tuned out of your conversation, so too your partner can tell the same of you. So, choose a time – be it breakfast on the weekend, half an hour at the end of each day - to really be present. And, wherever you are, be there wholeheartedly. Turn off your devices, keep your attention fully on your partner, and try to live in the moment. It's easy to fall into defined roles in romantic relationships – the Talker versus the Listener, the Giver versus the Taker. Relationships can end up quite one-sided. Sure, it may seemingly work, however the benefits of good relationship can’t be gained from sitting on the sidelines. Research has shown that personal self-disclosure is important for maintaining good relationships . So that means not just being a good listener but being willing to be listened to as well, and being okay to take when you generally feel more comfortable giving. Share the good, the bad and the ugly with your partner. Modern life can be busy and stressful, filled with deadlines to meet, appointments to attend, family and friends to keep in touch with, household chores to take care of, and so on. Along the line, relationships can fall by the wayside as our attention gets diverted to things that are more immediate and pressing. Amongst all of this busy scheduling and putting out of fires, we seem to think our relationships will just tick along without us having to actively work at it! However, let’s let in a healthy dose of realism. When have things just ticked along without any effort on our part? Our productivity, our health, and our wellbeing all require work, so why would relationships be any different? So, be deliberate in investing your time and effort when it comes to your romantic relationship. Make phone calls or send a quick message to show your partner that you care. Plan dates. Be available. Follow up on conversations. Recognise that what you’re doing will be worth the effort. Building better relationships for better health is serious business, but that doesn’t mean that you have to be too serious. If you want to build a better relationship, then start by being fun to be around. Get out of your comfort zone and try new things, take up a hobby. Play time can also help you to destress and feel more relaxed and, in turn, less reactive when it comes to interacting with your partner. So, schedule some leisure time into your week, where your only aim is to rest, relax and have some fun. Your relationship will thank you for it. With these four easy tips you can get on the path to a better relationship this week. 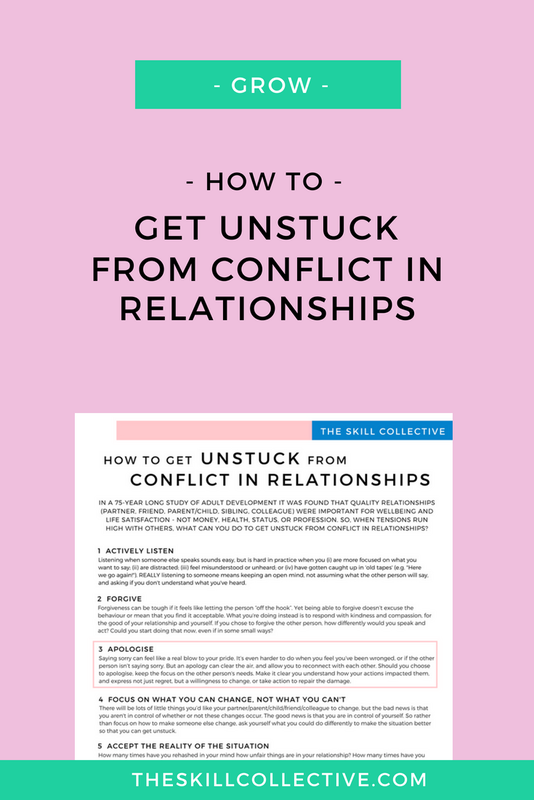 If you find there's conflict and tension in your relationships why not check out our Resource Library Tip Sheet on How to get unstuck from conflict in relationships? Written by our clinical psychologist Annie Malcolm, here’s a sneak peek below, and you can sign up for it (and access to all of our other Tip Sheets on wellbeing, mental health, and performance in our Resource Library). You're almost there! Check your email and you're one step closer to your tip sheet! (Tip - Can't find our email in your inbox? Check your junk mail folder, and be sure to add us to your Safe List!). Looking to build up your resilience and wellbeing? Meet your new best friend PERMA. Holt-Lunstad, J., Birmingham, W. & Jones, B.Q. (2008). Is there Something Unique about Marriage? The Relative Impact of Marital Status, Relationship Quality, and Network Social Support on Ambulatory Blood Pressure and Mental Health. Annals of Behavioural Medicine, 35, 239-244. Braithwaite, S., Delevi, R, Finchanm, F. (2010). Romantic relationships and the physical and mental health of college students. Personal Relationships, 17, 1–12. Jackson, T., Soderlind, A. & Weiss, K. E. (2000). Personality traits and quality of relationships as predictors of future loneliness among American college students. Social Behavior and Personality: An international journal, 28, 463-470.